For your brother in Jammu, you are someone who keeps him going, keeps him pushing to always strive for better. Let your brother know you would always stand by him. Send Rakhi to Jammu and surprise him with your token of affection. Jammu - famous for Vaishno Devi Yatra, is the Duggar land where the past still has a living presence! A land of grand ancient temples, and beautiful palaces, Jammu is also the winter capital of the state of Jammu and Kashmir in India. The culture of Jammu depicts the rich art and architecture and the culture of the medieval era, which is now the epitome. The people of Jammu are known for their warm hospitality and traditional culture. The locals here follow all the rituals and festivals with all the enthusiasm. Raksha Bandhan is an another celebration for the people residing here, and Floweraura helps them to enjoy the festivity in a better way by Rakhi delivery in Jammu online. On this auspicious occasion, you can send Rakhi with dry fruits online for your beloved brother working there. Raksha Bandhan tends to be one of the important dates for the residents. Moreover, Floweraura promises to make this sibling festival more joyful and cheerful for the people, by sending Raksha Bandhan Gifts to Jammu together with artistic Rakhi and the best thing we give free home delivery as a bonus. Brothers and sisters may always quarrel with each other on petty issues but on this day, their emotion is something else. Such is the magic of this festival and for your brother, Silver Rakhi online can be the best choice. No one generally wants to give this festival a miss until and unless there is some kind of professional commitment. So, if such is the case and you cannot be in your hometown Jammu, you can always send Rakhi to Jammu using our Instant delivery and reliable services. 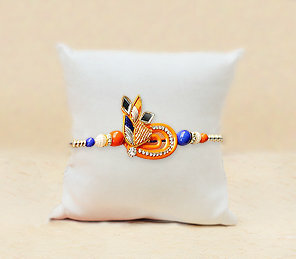 For your handsome brother, we have a wide collection of amazing Rakhi designs made of different materials. Place an order with Floweraura and get rakhi gifts delivery in Jammu, you can also avail same day delivery, in case you are late. If somehow you forget this day and are worried about how to deliver a rakhi for your brother living in Jammu, Floweraura’s Today Delivery to Jammu is what you are looking for! Through our Express Delivery in Jammu, you can send Rakhi online on the very same day of order and there’s no chance of your brother getting disheartened. Sounds amazing right? Therefore, send a perfect set of rakhi along with roli & tikka keeping up the festive spirit of Raksha Bandhan high in Jammu through Floweraura’s amazing collection. Your brother will definitely love the artistic rakhis provided by us and this festival will definitely be memorable and amazing for them. Happy Raksha Bandhan!